Apparat, aka Berlin's Sascha Ring, has had one hell of a year. His collaboration with Ellen Allien, the critically acclaimed album Orchesta of Bubbles, forged electrifying new connections between techno, electro and pop music. They developed the material into an electrifying live show that wowed clubs and festival audiences the world over. Apparat kept honing his solo show at the same time, delivering a powerful electro/techno laptop attack that would leave crowds twitching in its wake. And somewhere, in between all those activities, he managed to record Walls, his first solo studio album since 2003's Duplex. Despite its title, Walls isn't about dividing lines. Instead, it describes a circle that pulls many elements together into a protected, enclosed space where they jostle and roam free: strings and mallet instruments; rock guitar and gravelly sawtooth synths; stuttering digital percussion and muscular studio drumming. 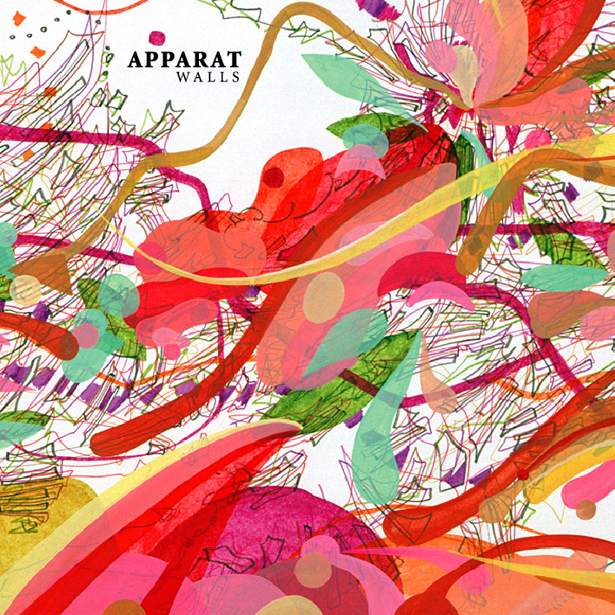 "This record isn't really a focused and conceptual production," says Apparat. "It's more of a 'last-two-years of Apparat compilation.' That's why there's so much different stuff on it, a lot of different influences. What can I do—when I worked with Ellen we had a certain amount of time and a plan of what we wanted to do. When I made Walls I was just collecting some of the best ideas out of a folder with around 70 unfinished tracks, and finished them." The thing is, you'd never know it from listening to the album. What might be most striking about Walls is the way it creates a kind of single, sustained mood—this is an album for listening to all in one go, front to back. (Though try it back to front, too, and all mixed up; it just gets richer.) This is one of those road-trip records, one of those coming-down records, one of those bedding-down records, that soaks up the room tone of the life being lived around it—and colors those experiences in equal measure. But a sustained mood isn't the same as a uniformity of mood—quite the opposite. The record veers from the chamber minimalism of "Not a Number," with its cello and vibraphones, to the bluesy rock of "Hailin' from the Edge"; "Fractales Pt. 1" offers a sound that longtime Apparat listeners might recognize as most typical, while "Bassis" is, in its purest sense, a pop song. In fact, all of Walls could be, perhaps should be, considered pop—but call it pop by any other means. Apparat has melded his genius as a sound designer with his growing songwriting talents to craft 14 songs brimming with ideas, energy, texture, light, color. They are hummable, embraceable, swimmable, possibly edible. They feel as ephemeral as clouds and as solid as the ground you're standing on—a fitting contradiction for a record that draws equally from software and acoustic instrumentation. Maybe Walls takes its title in reference to Phil Spector's famous "wall of sound," because listening to the record it's easy to imagine a massive sonic surface that first looms before you and then lets you pass through, pliant and porous. Appropriately, for such an enfolding form, Walls ultimately isn't only a solo joint: a number of talented artists assisted Herr Ring on the final project, from Telefon Tel Aviv's Josh Eustis, who did the album's final mixdown in Chicago, to Maria Hinze, who painted the cover. (Ring met Hinze years ago when she painted an entire room of an exhibition based on Apparat's music.) Kathrin Pfänder and Lisa Verena Stepf (Complexácord), who worked with Apparat on his Sizilium EP, play the string arrangements that give the record so much of its warmth; Jörg Wehner, a colleague from Apparat's home town, plays drums on "Halo" and "When." "Lime," a leftover from Apparat's Duplex, features Klas Yngborn, who also sang on that album. And another Sizilium veteran shows up to sing on four songs: the talented Raz Ohara, whose album The Last Legend (Kitty-Yo, 2001) is surely one of the great classics of moody, post-electronic pop. His voice—smoky, pained, plaintive yet determined—makes for the perfect foil for Apparat's electro/organic timbres and pliant structures. Apparat himself lends his own vocals to the other three songs with vocals, and lo and behold, he's as impressive a singer as he is a producer, whipping up a golden falsetto (on "Arcadia") that could give Thom Yorke a run for his money. Of his process, Ring says, "I was bored of too much programming. My studio is quite a playground these days. Lots of instruments. I'm running around like crazy when I'm inspired and I record, record and record." Maybe Walls refers to climbing them, then? To finding an escape from routine? In the end, it really doesn't matter what kind of metaphor you try to find in the title. Walls houses a magic box: a compact hour of music that promises to give back many times as much in pleasure, cementing Apparat's reputation as one of the most exciting, unexpected and musically generous artists working today.